And at the Port of Los Angeles, the nation’s biggest, business is really booming — recording its busiest July in history. Port officials said 833,568 20-foot equivalent units (TEUs) were processed last month, the strongest July in its 111-year history. That exceeded July 2017 results by 4.7% and was the fourth busiest month on record. Imports in July were up 5% to 438,165 TEUs compared with 2017. Exports climbed 8.4% to 167,992 TEUs in July, and empty containers were also up 1.2% to 227,412 TEUs from the same period in 2017. “With a robust economy and cargo owners moving goods ahead of expected tariffs, our terminal operators, labor force and supply chain partners seamlessly moved a record amount of cargo across our docks,” said Gene Seroka, executive director of the Port of Los Angeles. While the Port of Los Angeles was setting a record, the nearby Port of Long Beach, the nation’s No. 2 port, saw container volumes dip by 4.4% in July. It moved 688,457 TEUs compared with 720,312 in the same year-ago period. Still, for the calendar year, the Long Beach facility is on a pace to have its busiest year ever. To date, volumes are up 11.3%, or almost 500,000 TEUs ahead of the same period in 2017. 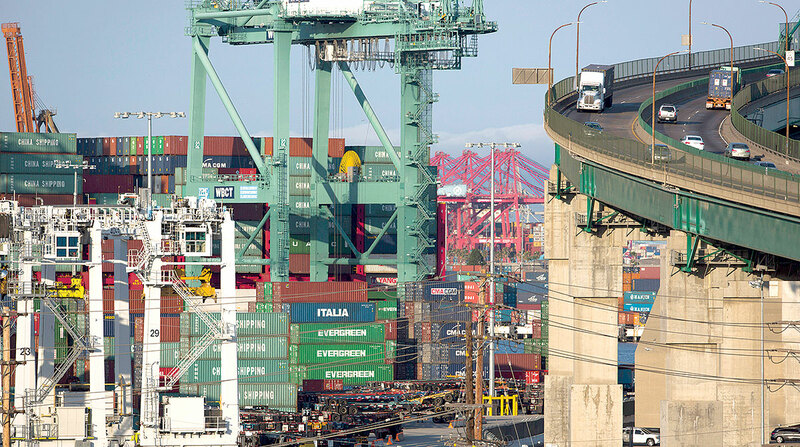 In June, Long Beach set an all-time record with 752,188 TEUs. Port officials said they believe July’s TEU dip at Long Beach was caused in part by concerns that “escalating tariffs could slow activity” during the remainder of 2018. Some trade experts said Long Beach may be the first indicator, even while other facilities are still running at full speed. The Port of New York and New Jersey said it set a six-month record cargo volume for the first half of 2018, up 6.8% year-over-year, handling 3,450,469 TEUs compared with 3,229,675 for the same period in 2017. The Georgia Port Authority said July 2018 was the second busiest month on record for the facility. TEU volume was up 12.7% to 378,767 compared with 336,099. “July was an incredible start to our fiscal year, with double-digit growth across our container, breakbulk and dry bulk operations,” said Griff Lynch, executive director of the Georgia Ports Authority. The Northwest Seaport Alliance that operates facilities in Seattle and Tacoma, Wash., saw an 8.8% increase in TEU volume in June, reaching its highest level since 2010, moving 144,491 TEUs. Officials said June foreshadows the strong peak season that forecasters are expecting, but shippers may be trying to get ahead of the upcoming tariffs.